Just because Mother Nature serves up a chilly evening, that doesn’t mean it’s time to retreat indoors. Ed Hall and Hamp Tanner, co-founders of Well Traveled Living, have made it their mission to design and import all sorts of innovative outdoor living products, so you can cook, stay warm, and keep the party going even when cooler temperatures arrive. 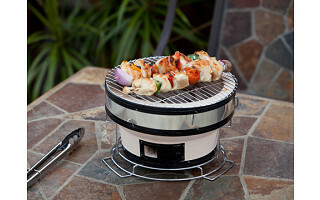 For the grill master of the family, Ed and Hamp have designed a range of compact, easy-to-use Yakatori charcoal grills that heat up fast and stay hot for hours (except the handles, which stay comfortably cool). Sleek and modern, these grills are hip enough for backyard dinner parties and sturdy enough for football tailgates and beach parties. There’s even a folding go-anywhere notebook grill that’s not much bigger than a laptop. When temps start to get chilly, you and your guests can stay warm with a patio heater. Table top propane or halogen heaters are perfect for an intimate gathering. When the crowd rolls in, one of the commercial-grade heaters (like you see at restaurants) will keep the chilly air at bay. So don’t hunker down when the cold arrives, live it up. Hello Daily Grommet followers! We're excited to have this opportunity to present some of our products to you on Daily Grommet. At Well Traveled Living we're continually developing and expanding our full range of innovative outdoor heating, patio, home & garden products. Our products are marketed under the FireSense, PatioSense and GardenSense brands. We pride ourselves on delivering quality product and unsurpassed customer service and support. Please give us the pleasure of helping you extend your backyard entertaining season with Fire Sense! We look forward to talking with you and answering any questions you may have. The umbrella heater looks like a fan. Does it also function as a fan? Does it need to be removed before you collapse the umbrella? Kate, The umbrella heater only functions as a heater and is comprised of three separate heating elements (infrared lamps) that can all be used independently or collectively. To collapse the heather, each of the three arms folds down so that the entire umbrella can close around the heater with no need to remove the heater. I hope this answers your question satisfactorily. Please let me know if you have more questions. does the rectangular grille have a handle? 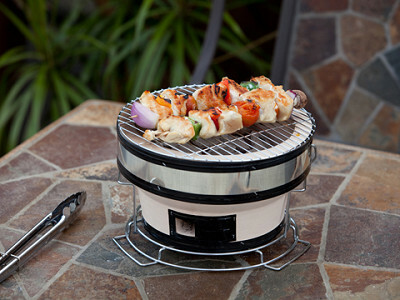 @ JLM: The entire ceramic grill sits in a metal basket, with handles at the short ends. Going to have some family in for the holidays and was thinking that one of these would be great for our table on the deck. Can you tell me the difference between the electric and the propane, other than how it runs :). Does one heat better than the other? That's what I'd like to know too. I need to order very quickly though. @Jen and @Ann Arnold: Thank you for your interest. The info is in the DETAILS tab (under video & photos). Both heats well. Just because Mother Nature serves up a chilly evening, that doesn’t mean it’s time to retreat indoors. Ed Hall and Hamp Tanner, co-founders of Well Traveled Living, have made it their mission to design and import all sorts of innovative outdoor living products, so you can cook, stay warm, and keep the party going even when cooler temperatures arrive. For the grill master of the family, Ed and Hamp have designed a range of compact, easy-to-use Yakatori charcoal grills that heat up fast and stay hot for hours (except the handles, which stay comfortably cool). Sleek and modern, these grills are hip enough for backyard dinner parties and sturdy enough for football tailgates and beach parties. There’s even a folding go-anywhere notebook grill that’s not much bigger than a laptop.